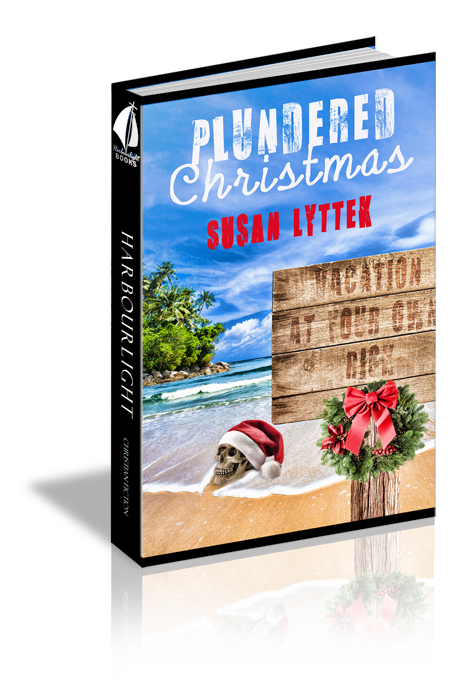 Compelled to spend Christmas on a private island with her father's future bride and her family, Jeanine learns that Margo Banet is descended from a pirate queen. Relatives and friends all have their reasons for attending the festivities--including the legendary treasure. But when Margo's nephew winds up dead and a violent storm cuts them off from the mainland, Jeanine has to wonder if they will solve the mystery before someone else dies trying. I love Christmas. I adore Christmas. I start getting ready for the next Christmas right after the last one finishes. I am one of the first people you will find at the day after Christmas sales stocking up for next year. Christmas is my absolute favorite day of the year, and I wish I could make it last for a week at least. Nevertheless, I didn’t love this one. And I couldn’t wait to escape it. In the first place, it didn’t feel much like Christmas. Christmas, to me, meant Dad’s house with the fire roaring, a tree twinkling, and so many lights that the electric company writes him thank-you letters when he pays his bill in January. Or it meant the quieter Christmas at Mom and Dad Talbott’s with carols playing softly in the background, the persistent aroma of her secret gingerbread recipe, and a tree cut fresh from their back forty. It did not mean eighty degrees, pirate legends, and a dead body. No. It definitely did not mean any of those things. I’m getting way ahead of myself. But I do that. It’s a sign that maybe, just maybe, I’ve had too much coffee. Nah. James, my sweetheart of an Army captain, says I love it too much, but honestly, I can’t believe that the words “too much coffee” could ever apply to me, Jeanine Adorabelle Talbott. Since James and I moved to Gentle Springs last year, mystery has plagued us. First, it was that treasure hunter killed in the cemetery next door. Then, when Justin, Josie, and I went up north for a field trip with our homeschool co-op, our tour guide became a victim of manslaughter. Now here. That kind of track record is great for books and movies, but not for me. Speaking of track records, this is now three for three that soccer had something to do with our involvement. Maybe I should encourage Justin to find another sport. He is getting awfully good at tae kwon do. But that wouldn’t be fair to the Hornets. He is the best eleven-year-old goalie in the entire county. This Christmas actually began back in June. In honor of Justin’s eleventh birthday, my dad invited Justin to accompany him and his bowling buddies to Virginia Beach for three days. James and I encouraged Justin to go because he was down in the dumps and needed a boost. His soccer team had only come in second place. We were rejoicing about second place. They had played well and beaten some tough teams to achieve it, but since he’d come in first with his team in Georgia the year prior, he expected more of the same. “The Hornets are way better than my last team, Mom. It doesn’t make sense that we came in second. We should have won.” Justin grumbled. How do you convince an almost-eleven-year-old that life is good after he tastes defeat? We didn’t know. That’s why we sent him to the beach with grandpa. In all the rave reviews about the vacation, there was one thing Justin didn’t like. His grandpa came home from the trip with a girlfriend. “And it was all my fault, too! If I hadn’t been dribbling up and down the beach while they snoozed, we never would have met her.” Again, he grumbled. Turns out, the gentle breeze off the ocean and the warm early summer sun had knocked out the bowling buddies. Dad insisted he was awake and reading, but I know his time window between reading a page and snoring can be extraordinarily short in the right circumstances. Justin, tired of just sitting in the sun, picked up his soccer ball and headed down the beach. The rule was that he had to be able to see “the guys” at all times. Keeping one eye on his chaperones distracted my dribbling goalie. The ball hit too far back on the side of his foot and careened wildly—right into the side of a woman’s head. Justin said she had on clothes too fancy for the beach and had walked right out of one of the poshier hotel complexes. It didn’t take her long to find the sheepish looking culprit. She picked up the offending ball, marched over to Justin and demanded to see his parents. “I’m here with my grandfather,” Justin admitted, pointing to the line of reclined beach chairs. She marched over to Dad, where she laid into him for neglecting his grandson and causing her bodily harm. Evidently, she used a lot of legalese. Dad, after nearly thirty years as a practicing lawyer understood every word. In addition, he dished it right back, telling her he could pull her in for unlawful possession of a soccer ball and some other such nonsense. Justin said he didn’t pay attention to much of it. He kept noticing how much, in her face, the woman looked like Grandma. That detail obviously didn’t escape my father, because after Dad asked Justin to apologize he asked the woman out to dinner. Fast forward to November. Over the summer and into the fall, Margo Banet and Dad courted, mostly via long distance phone calls. My dad, much to my surprise, even opened a social networking page to “chat” with the woman on a regular basis. Things were getting serious. Too serious. Now if my brother, Frank, were having a conversation with me about a new woman in his life, I would cheer. He was nearly thirty, and I hadn’t even heard the faintest tinkle of wedding bells from his e-mails to me. He would tell me he went on a date and to where, but I only occasionally, maybe one out of ten times, got a name. The most recent name started with an A. When we visited Dad for Thanksgiving, my father pulled me aside. “Five and a half. But who’s counting?” chuckled Dad. Then he started to head out to his workshop. “I’m making her a present.” He sounded like a schoolboy. Call me an idiot, but I hadn’t thought that far ahead. Doesn’t the bride move in with the husband? Usually, I supposed. But this bride was wealthy with a capital W. Would she be content with Dad’s little retreat in the woods? Would she be willing to give up her wealthy lifestyle and a house with space enough for dozens of visitors? I had never met her personally, but she had “friended” me because of my father. Moreover, I could see the circles she moved in. Somehow, I rather doubted she would become a companion to the wives of Dad’s bowling pals or join the local knitting league. She was not housewife material. More likely, Dad would be the house husband. I wanted better for my dad than that. In truth, I guess I wanted Mom for him. I checked the timer on the turkey. It had at least another hour. I needed some time to think. I asked my brother to call me if the timer read less than thirty minutes and I hadn’t returned. Culinary skills, he had none, but he could read a clock. And since the TV was in sight of the timer I figured he could keep tabs on the football and look over at the big clicking numbers every once in a while. “Take Jelly for a walk.” He couldn’t argue with that necessity, so he nodded, albeit reluctantly. I gave James a kiss between plays and let him know I was leaving the house. With football on, exterior awareness fades. I grabbed Jelly’s leash and hooked it up as carefully as I could, trying to get the minimum of slobber on me in the midst of his excitement. (If you don’t know it, we have a very good reason for calling him ‘Jelly’. He slobbers so much it tends to clump and looks like a dollop of apple jelly hanging below his jowls.) Our bulldog liked few things better than a chance to roam through the woods. He gave one eager grunt, so as not to violate the no-barking commands, and urged me forward. I steered Jelly to the path that headed downhill to the creek. I loved this path. I had first explored it with Sunny, the yellow lab I had as a child. She was a good and patient dog with an eye for keeping me safe. She pulled me away from more than one rattler in her years. When I had first come here, I was about eight and I hated the idea. I grew up outside Charleston and loved all the benefits a cultured city could give. The idea of coming out to a glorified cabin that was miles from anything, and even farther from my friends, both horrified and terrified me. But as child, I had no say in the matter and I went. It took a couple of summers and Sunny’s never-failing companionship before I began to look forward to the quiet. It helped, too, that I discovered Josephine about a mile down the road. We became close friends and stayed that way through the teen years. I was the maid of honor at her wedding and she was the matron of honor at mine. She means so much to me that James let me choose her name for our daughter. I looked up. I knew the stone path that wound through the evergreens. It hadn’t changed much. My feet had brought me to her door after all these years. But it wasn’t her door anymore. Her parents sold the place years back and lived in a nice community in Northern Florida. And it had been nearly four years since I had seen Josephine. Both of us married military men. Unfortunately, her Air Force husband took her in different directions than my James took me. The last time we had tea together, at a quaint spot near her parents’ condo, was just before they shipped off to Japan. If everything worked out according to their current orders, he’d be working at the Air Force Academy next. It might be stateside, but still way too far away. Jelly gave the leash a slight tug, looked up at me and yipped. “You’re staying too much in the past,” his dark eyes seemed to say. At a faster pace, I led him back to the cabin. It was only when I got within eyesight that I realized I had not spent a single solitary moment thinking about what I intended to. Nor, had I asked God’s opinion on any of it. I just fretted, letting the worry tracks in my brain play on whichever one happened to be handy. For the last part of the road, I urged Jelly into a run. Those little legs had such power and determination that our dog relished the exertion more than I did. But at least it did blow some of the cobwebs out. I breathed a short prayer between my gasps for air. I really needed to exercise more. God …make…things…work…how…you…want…them. It wasn’t much, but I felt better. I couldn’t control my father in any case. God knew what Dad needed and if Margo was meant for him. I used the rag we had hanging there to wipe the majority of the slobber off of Jelly’s mouth before I unclipped his leash and led him inside the house. “Thanks, boy,” I said as I patted his rump. Thinking I wanted more, I guess, he quickly turned and licked my face before I could stand up and out of the danger zone. Since our drooling canine had already made his way into the house and couldn’t damage me further, I went inside with Justin. I would finish Thanksgiving dinner, with help from both kids, and get it on the table. Justin could open the can of cranberry sauce and heat the gravy. Josie could mash the potatoes and put the pie Mrs. Folger had made for me in the oven to heat. But first, I would head to the bathroom to wash my face. Forty-five minutes later, all the food had been transferred to the middle of the big table and we took our places around it, Dad at one head and James at the other. Frank and I had called it the “big” table ever since Dad had found an old door at a nearby rummage sale and turned it into our formal dining table. (With just the four of us, we usually ate in the kitchen.) The big table always set the stage for holiday dinners or company coming. As I wondered why Dad held off on blessing the food, I noticed that he had changed his clothes. When I left for my hike down memory lane with Jelly, he had been in his usual red flannel shirt and khakis—Dad’s standard uniform. Now, he wore the sweater I bought him for Christmas last year, a pair of dress slacks and his silver hair had been slicked back. If I hadn’t seen him race to the door, I wouldn’t have believed it. He made it from the table through the living room, down the front hall and to the door in less than ten seconds. I heard the door open. I could have heard a pin drop because everyone at the table kept quiet. I tried to encourage the amplification abilities of my ears. “No, Margo, not at all.” I heard some shuffling sounds, other movement. It was all I could do to keep from leaping out of my chair and heading into the hallway to watch them. “Did you say ‘we?’” Dad asked. The waiting had gotten too much for Justin. I admit it, the smells coming from the table made my stomach complain. “I’ll ask.” Taking a deep breath, I prepared myself to meet my mother’s replacement. Walk purposefully, I told myself. Be dignified. I strode through the living room and started into the hall. Unfortunately, Dad has hardwood floors in the hallway. I say unfortunately, because my dog had been sitting in the hallway waiting for us to call him for treats. And if a dog is anticipating treats, any dog, he tends to salivate. My dog? He leaves drool puddles. I hit a spot as slick as ice and slid about three feet towards Dad and his lady friend before my feet lost all semblance of traction, kicked up, and sent me to my backside. It would have done the Three Stooges proud. However, it did not seem to have that effect on Margo. “What?” She huffed. She looked down at me over her nose. I felt like a five-year-old back in mean Miss Anderson’s kindergarten class. I had to admit, as much as I didn’t want to, that her face did resemble Mom’s. She had the same tiny mouth, beneath a fragile nose. Even her eyes were the same blue green. The color of the sea, Dad had always said. But her cheekbones had more of a chiseled appearance, more refined. Mom looked softer. Or maybe my memories had her look that way. She had been my mother after all. “I had come out to hasten you to dinner,” I admitted. “The kids are all a bit hungry and the food is getting cold.” I leaned in to my father and whispered to him that he should give Margo my place setting and that I’d bring out another one. Dad escorted Margo to the dining room, deftly ignoring the pre-slicked areas of the floor. I began to follow them when I heard a slight knock. As I headed to the door, it opened and a man peered around the edge. Atop his head was a traditional white driving cap with dark black trim. I assumed he was Margo’s driver. The gentleman looked older than Dad did. What a difference a rank in society made! Dad, because of his years in the law profession, the money he made and the friends he helped, was Margo’s beau. Yet another man, equally hardworking and helpful, drove her places and served her. It didn’t set right with me. “I don’t want to cause trouble.” Though he hadn’t moved, he seemed to pull away from me. “No trouble at all, Mr...” I left a blank waiting for his name. “No mister,” he said. “Just call me Charlie.” He took off his hat, held it in his hands and looked down on it.